My husband and I decided to go homemade for valentines day this year. 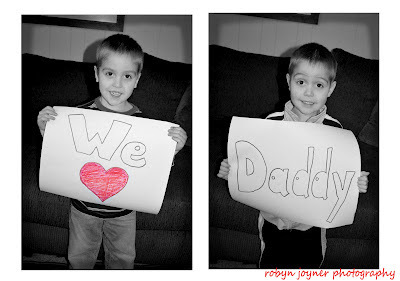 I decided to get the other men I love in my life in on making my wonderful husband feel loved. We first surprised him with some Donut Holes by his coffee maker:) Thankfully he shared with us all! We made him a gift for his desk at work. I needed to keep costs low, so I tried to use items from around my house. We had a large roll of paper from the local Habitat for Humanity ReStore and after I wrote the words I had the boys color the heart red with crayons. I used an editing software to make the collage below. If you don't have that, you can use the editing tools at the printing kiosk, then print a collage. We printed this out for 9 cents and then put it in a nice $2 frame! He really loved it, and can be reminded everyday at work how much we appreciate him! No reason the boys can't be involved in telling Daddy how much we love him! The day before Valentine's Day we worked on cards. I have to wait til the day before for holidays because my boys are really bad about telling my husband the moment he gets in the door that we have a surprise for him. I assisted the boys in making the card below, then the boys colored several pictures for their dad and dictated their words to me. *Teaching moment- We talked how to begin and end cards, and then they verbally practiced structuring paragraphs while watching me turning their words into written form!